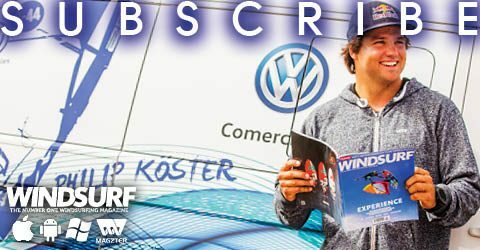 Windsurf MagazinePETER HART - THE FREESTYLE DIRECTORY WHERE DO YOU START? Originally published within the April ’18 edition. Freestyle, at one end of the achievable spectrum, is beyond the horizon for the majority of the windy populace – but at the other end … isn’t. For those looking to take their windsurfing beyond dry cornering, Harty gives you a rundown of tricks ancient and modern, describes just what they take and where to start. The gradual slide into dreary incompetency … can there be a more miserable prospect? I sincerely hope you don’t feel like that about your windsurfing. You may be 2 kg heavier and marginally less mobile thanks to having embarked on a heavy breeding program, which has ‘hoovered up’ precious water hours – but that’s not a reason to give up on progress. And progress in our sport is happily not about shaving 10th off personal bests – but in skill acquisition and in embracing new experiences. I’m not suggesting that a steady upward improvement graph is the only way to sustain interest … but a sense of achievement sure brings a spark to the marriage. Freestyle, of the right type, can be that spark. Freestyle reinvents itself by the hour and at the top end is of the same relevance to the recreational trickster as being 30ft inverted above the half pipe has to the holiday snowboarder. But you can always take lessons from the best. Firstly they choose and tune their kit minutely to make a trick easier … or possible – and everyone should do that. In the shot below, the supremely able Sarah-Quita Offringa captures every aspect of new freestyle. She is balanced and at the same time hyper-contorted. 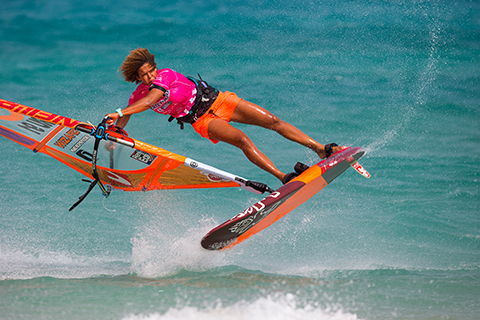 Her big board, small rig combo gives her speed and therefore height – and at the same time control during the transition. And look at the board – it’s a slalom slab with a tiny fin and yet incredibly fit for that purpose. The names of the tricks at one time conveniently described what was going on – eg ‘sail and body 360,’ ‘body drag,’ ‘one handed 360’ etc. The new ones are utterly random (mostly foreign swear words). Don’t worry about them – you’ll learn them when you need to. However, what are important, are a few idioms we rely on to describe key elements within a move, which if you don’t understand, will leave you struggling to fathom what the hell I’m talking about. There aren’t that many – and some you will certainly know. So here goes. Clew first. It’s sailing with the rig the wrong way round, that is to say with the clew end of the boom facing forward. For extra points, some tricks are completed entirely with the sail clew first. Switch foot. If you were to carve a gybe and didn’t move the feet as you powered up on the new tack, you’d be sailing away switch foot. Many of the ‘new skool’ planing tricks start with sailing the board from the wrong set of straps ‘switch foot’. Carving tricks. It’s any planing move where you change direction by banking the board and turning around the edge, e.g. carving 360. Sailing backwinded. It’s when you’re on the ‘wrong’ side of the sail facing the wind and pushing (rather than leaning back …) against the rig to control the power. Many tricks, old and new, have a backwinded moment. Ducking the rig. It’s the act of getting to the new side of the sail by ‘ducking’ under the foot of the sail, as in classic tricks like the duck tack and the duck gybe. 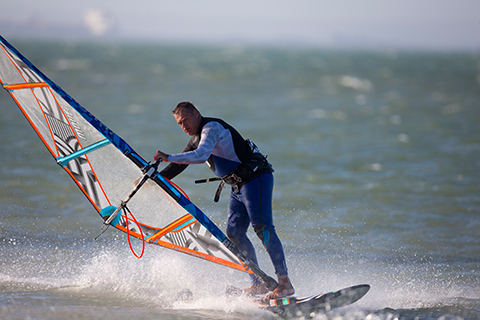 In a more modern context, freestylers duck the sail while fully planing on a reach to end up sailing backwinded – and then boost the board out of the water by pushing on the boom. Back to sail. It’s what it says on the can – sailing with your back to the sail either on the leeward or windward side of the rig. Pop. The majority of the new skool (more about the ‘skools’ soon) planing tricks start with a ‘pop’ where the sailor, often on flat water, bounces the board out of the water before performing some kind of aerial spin. So it’s a jump then? Well sort of, except a ‘pop’ is done chiefly by banging down on the back foot and corking the tail out of the water – after which you pivot round on the nose (nose down tail up). Hence freestyle boards have super thick tails. By contrast in a jump (also the platform for many tricks) the idea is to get the nose up first and then pull the tail up to meet it. It’s a subtle difference. SKOOLS of THOUGHT – a little history. Understanding where all the tricks and styles have come is historically interesting and may inform your choice of kit and pathway. Freestyle has always reflected the kit and sailing style popular in that era. In the earliest days, that meant sailing up and down mostly off the plane on a longboard with a daggerboard. It became a massive competitive discipline and the breadth and complexity of the tricks was astonishing. At the easier end of the scale you had head dips, sailing sitting, lying down, inside the boom or back to sail. There were tail and nose sinks, pirouettes (where you release the sail and spin through 360°) and even somersaults through the boom. I could go on forever. The classic trick of the era was the railride, tipping the board on its side and standing on the edge, (or even on the underneath of the board, aka the “Everoll”). In the 1986 Mistral Worlds, Swiss sailor Fritz Schon famously completed his whole 3 minute routine, including tacks and gybes, on the rail, in one section with the sail upside down. Light wind freestyle is a ballet. 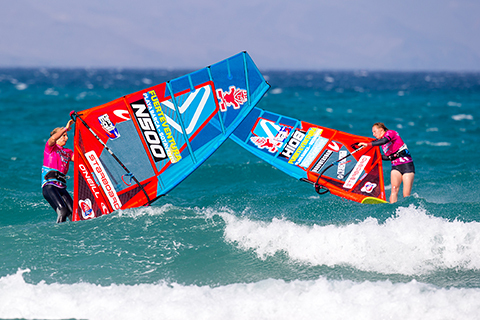 It’s about agility and movement, wind awareness and controlling the rig from the most eccentric positions – all essential skills in every branch of windsurfing. It was called ‘longboard’ freestyle but today is performed on any board that floats high off the plane. Short board fever took hold in the early 80s and naturally spawned a new, faster form of trickery. The first moves were permutations of the gybe such as the ‘slam’ and ‘slide’ gybe where the board was slashed or skidded around with a bucket of spray. There were multiple variations of the carve gybe including hand drags and no-hand rig changes and changes with a sailor pirouette. The first real head-turner of the day was the duck gybe – the double loop of its era, which was then superseded at the top by the carving 360, made especially famous by the epic video ‘Trade Winds.’ It featured early superstars Mike Waltze and Fred Heywood (speed king) staging a contest to be the first to complete it – the loser being made to sail a door as a forfeit. As skill and imagination developed, the pioneers took many of the classic longboard tricks onto their short boards and into planing winds – tricks like the helicopter-tack, the duck tack (wildly difficult), the nose sink tack, and slightly later on, the ‘monkey’ gybe, which depending where you’re from, involves a gybe with a full sail and body 360 somewhere in the transition. These ‘tricks’ are seen as relatively straight forward today. However, back then they absolutely weren’t thanks to very small, narrow unforgiving boards and rigs, which with their long booms and dodgy profiles, were unstable, unwieldy and slow to manoeuvre – there’ll be a lesson there. The ‘new skool’ movement took hold towards the end of the 90s following a decade that had been all about speed, dedicated slalom boards (very technical to sail) and camber induced rigs (hard to rig and even harder to throw around) – and during which windsurfing was sliding gradually up its own over-technical backside. The spirit of ‘new skool’ was drawn from freeride snowboarding and sought to inject our sport with some youthful exuberance and attitude. Within a couple of years it had become a professional discipline. The hallmark of the style is that most of the tricks are performed on the plane in the straps. The first wave of stunts were ‘pop and slide’ tricks. The Vulcan, an aerial gybe where you spin the board through 180º, flip the rig in mid air and land sliding backwards on the nose, was the building block for many variations. The king of stunts was, and arguably still is amongst amateurs, the speed (aka flat water ‘spin’) loop – which also has the massive advantage of being both wildly spectacular and relatively easy. The focus more recently has gone from sliding tricks to full speed aerial power moves. At the top end the level is otherworldly – and getting more so with every passing hour. 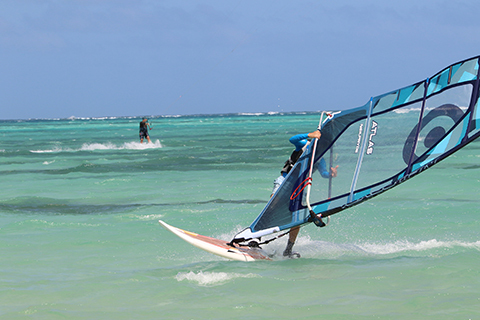 Thanks to the power of the rig, windsurfing is the only freeride discipline where riders can complete forward and backward rotations within the same move. And one trick, in competition at least, just doesn’t cut it. The best are stringing 2 and 3 together, the landing of one being the springboard for the next. Not surprisingly, this style has developed alongside very specialized equipment. Read on. All those styles are still out there. So where are you going to go? Choice of kit will be the limiting and enabling factor. Lets us confront the key questions. What tricks are possible/advisable with a standard 120-130 freeride board? A freeride board is primarily about speed. It’s therefore a good platform for gybing variations – ducks, monkey gybes, one handers, pirouette gybes etc – also for the classic straight line tricks such as the body drag. Variations on tacks – the helicopter, push tack and duck tack – are all possible with the right sail (i.e. small – read on). Depending on sailor size it might just be big enough for light wind practice. As you move up the scale however, the limiting factors are the long fin and the outboard straps. The long fin restricts how tightly you can carve and makes it especially hard to bounce the board out of the water. It’s NOT a pop and slide machine. Yes you can reduce fin size to a certain extent but go too small and it won’t plane. The outboard strap positions also limit your options. The inboard straps of the freestyle board allow you to trim the board with toes and heels as you spin and pivot. That’s virtually impossible with the feet out on the rail. Jason Polakow’s routine at the ‘King of the Lake’ contest in Lake Garda in 1998 – the coming out party for New Skool freestyle as a competitive discipline – included a carving 360, a pirouette gybe and a Spock. It’s a proper mix of the new and the classic, which he did on a wave board. That would be a great routine for today’s emerging freestyler and one for which the modern freestyle wave board is ideal. It has enough volume in the tail to pop and yet has enough curve and rocker to carve a proper turn in and out of waves. The latest freestyle boards are highly focussed. With their straight, slalom rocker, they are very quick to plane and super fast; but having such thick sharp parallel rails, they do not carve a sweet turn. It’s all about speed and then boosting out of the water. The top tip when buying a fsw for all-round freestyle is to go big. Look for at least 20 litres of reserve volume – that means 100 litres for an 80 kg sailor. Extra volume allows you to plane with smaller rigs and lends that vital extra support in moves where you finish off the plane in the straps – upwind and downwind 360s, sliding around the last few degrees of a Spock for example. When someone asks what board they should get to pursue some freestyle, the very fact they’re unsure makes me scream ‘freestyle wave!’ The boards used to pioneer the first ‘New Skool’ tricks back in the late 90s were effectively fsws. So the new ones, vastly better now, have the pedigree to take you a long way up the ladder. More importantly they’re fun and easy to sail which can’t be said of all freestyle boards. Where they win over a freeride board is the inboard straps and smaller fin options. The inboard strap settings allow you to use the front foot as a platform, which is key in so many new and old tricks. Do sails make a big difference? Oh yes! Start by being aware of what doesn’t work. Too big! The harder it pulls, the less you can move, the more it upsets the trim when you release it and the harder it is to chuck away and hide. It’s rare to see a pro freestyler using bigger than a 5.3. Most of the time even the big guys are on 4.7s or less, even in 18 knots – because it makes the rig transitions so much easier. Such a small rig is out of the question for the majority because it takes a dollop of strength, skill and fitness to get the board planing with so little cloth. But understand that for every half metre you hoist above 6.0, the tricks, especially the upwind ones involving a duck, or backwinding or driving the clew through the wind, get exponentially harder. Wrong shape. Bigger sails are cut for speed with a lower foot and recessed boom. That increased area below the boom makes every trick harder, especially the ducking ones. Too full. Freeride and racey sails with a fixed camber never stop pulling – even when you sheet out (which is desirable when you’re racing). But in freestyle you want the sail to flatten off and play dead as you depower, so you can release it, duck it, or lay it down in the knowledge it will play dead and lie there inert until you call it back again. Would a freestyle sail be too specialist for learning the basics? The latest designs, like the boards, are built for a very specific function. It’s all power on to get planing and then power off for the trick – its twitchy feel is not beloved by the more ‘allround’ freestyler, who prefers the power to come on more gradually to help him set the rail and stabilise the manoeuvre. Many of the design features of the freestyle sail, such as the high aspect, the forward effort and very tight leech, are all there to make for an easier duck – a key aspect of a large percentage of the latest tricks. A wave sail or even a crossover sail is a more secure bet for most. Can I set the freestyle wave board and rig up differently for freestyle? You can certainly tune your wave or crossover rig for freestyle. Be gentle with the downhaul – you’re not after top speed but want the leech to be tight and reactive. Loose cloth, whether it be a floppy leech or loose cloth between the boom arms at the clew end, will make the sail unstable in the transitions. As for the board, you must get used to the inboard strap settings and open them up wide so both feet are across the centre-line. In carving moves and new skool spins, you spend a lot of time trimming the board with the front foot. As for the fin, if you’re targeting carving tricks, you can stay with the given wave or crossover fin. If you’re going for your first pop and slide tricks (Vulcans etc)then the small freestyle fin will really help the tail release. The issue is you’ll have to totally change your sailing style. Get off the back foot, lean forward, sail off the heel of the front foot and use the windward edge for grip. Time to get out there. LIGHT WIND PRACTICE – you’re mad not to! Many regard it as a waste of a session but by so doing consign themselves to a skill desert. The big floaty board, small rig combo teaches you so much about posture and not relying on a grunty counterbalance. You improve rig mobility and realize that in certain circumstances, it’s OK to let go. You also relate rig tuning to ease of handling in the transitions. Check the skin tension of the sail in the light wind pic, which means it depowers and plays dead – essential when ducking. THE IMPOSSIBLE – can your combo do it? It’s a shame to pour cold water on any ambition but it is important to discover whether the trick you’ve targeted is actually possible given your chosen kit and the conditions. Here’s an example. The planing duck tack is a move that has confounded sailors for generations. From a reach, you turn switch foot so your back is to the sail, head upwind and then duck the rig to end up backwinded. You then use it to steer through the wind and bear away. It’s not particularly spectacular but strangely difficult with a tiny room for error. James arrived on a clinic having been trying them for years. In a force 2-3 and using a 5.7 on his 100 ltr fsw he went out (for the 1000th time) confident it was pointless trying them in planing conditions until he’d got the process worked out in light winds. I had to point out that what he was attempting was, if not impossible, then incredibly difficult on that choice of board and rig size. When he ducked the sail, he released mastfoot pressure, the nose rose up and shot downwind. Every time it turned into an involuntary gybe. It was almost impossible to stop that happening. The board was too short and the rig too big for light wind practice. With his combo it would be easier to try them on the plane where the board would be effectively more buoyant and where its carving momentum would keep carrying it upwind while the sail was being ducked. However, the immediate remedy was to rig down to a 4.7 and lend him a SUP. The 4.7 was easier to duck and the SUP holds its line and trim as you head up. He cracked a few immediately – off the plane admittedly – but he was on his way. 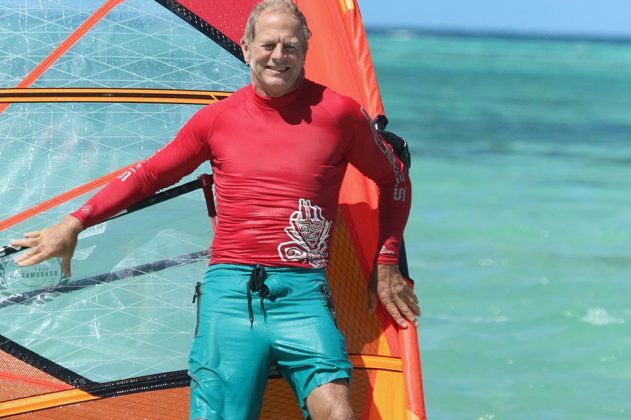 The biggest sail he uses for sail tricks now on his 100 fsw is a 5.3. Most failures I witness are not down to sailor ‘rubbishness’, but from trying the wrong moves with the wrong kit in the wrong conditions. THE IMPOSSIBLE part 2 – sail tricks and speedsters. Hark at this salutary tale. Bill asks Ben which would be the best trick to start with. Bill suggests a helicopter tack because that’s easy and you can practice in light winds. It’s easy for little Ben who spent his formative years on a pond chucking a rig around. But Bill is a devoted, weighty (105 kgs) high speed blaster who went from beginner to planing in the space of a few months and who had never purposefully slowed down and certainly never contemplated standing on the wrong side of the sail. Bill attempts these ‘helis’ in a force 4 on his 120 litre freeride board and favourite twin cam 7.5 and has a humiliating and ultimately fruitless time failing at something that didn’t even look that exciting to him in the first place. When it was pointed out that he had no chance on that kit and that he needed a big board, a small sail and some light wind, he replied he didn’t have a big board; furthermore he had neither the time, build, balance nor the inclination to pratt about in light winds. Speed was his thing. He actually admitted that his interest in freestyle had been piqued by Dave White’s light footed wizardry. For those unacquainted, Whitey, 115 kg at last count, is the big windsurfer’s Svengali and confounds the freestyling public by performing fully planing Monkey gybes at 40 knots on a tiny board (a speed needle at times) and often using a huge, fully cambered race sail. His shtick is speed. With speed his little board is buoyant and his rig is light. By his admission, his freestyling routine is limited to very rapid gybe variations. He is all too aware that if he does any trick that involves slowing down – he sinks. That is the approach Ben should take. Stick with what he’s got; use speed as his weapon to lighten the rig and bin the idea of tricky tacks. IMPOSSIBLE part 3 – short on a tool. Having ended up on the right kit combo, nicely powered on a beautiful flat water day, you start to run out of excuses. Failure from now on points squarely at pilot error. It may not be total rubbish-ness but often it’s the critical shortage of one key skill. When you eye up a trick, first pick it apart and see if you’re fully equipped technically. Take the carving 360. It’s a wondrous, achievable move and is a natural successor to the carve gybe. What’s it about? You carve in, tighten up the arc earlier; lay the rig into the turn much further than in a normal gybe. Then as you pass onto the new tack, the sail backwinds … that’s new … then what? The fact is that if you have never controlled a sail backwinded … well it’s a skill you’ll not suddenly pick up whirling around in a force 5. It’s all a blur and will excite the wrong reflexes. If you get tripped up by a certain 3 note phrase in a long music piece, you don’t go and repeat the whole thing, you isolate that phrase and play it slowly 100 times. It’s the same with a freestyle trick. You have to retreat to the pond and discover the secrets of backwind sailing – like sweeping the rig back and lifting the back hand to depower – yes, everything is the wrong way round. You discover that backwinded, you can get the board to turn upwind by dropping the clew into the water behind you and pushing on the back hand so the board pivots around the end of the boom. Through the wind, if you bring the rig upright sheet in and bear away, that’s the end of the 360. Now get back to the planing version. Success may not be immediate but at least that backwinded moment at the end will be vaguely familiar. ‘Big men don’t freestyle.’ Well apparently they do! Due to having to use big racy sails in the medium winds good for learning tricks, they struggle with the intricate, clew first back-winded, inside out sail tricks. So they need to tap into their one weapon – speed and momentum. Dave White has made speedy carving tricks something of an art form. People gasp in disbelief at how he dances his 115 kg frame around the mast with rig in hand fully planing. But it’s by going fast that he keeps the board buoyant and stable and the rig light. But it’s still very impressive. I saved it until last. But the fact that so many of the classic moves and tricky transitions – duck gybe, duck tack, push tack, slam gybe, monkey gybe, nose sink tack, switch foot and back wind sailing – have non planing versions, should give you a massive clue as to the best training regime. Speedy Bill was a lost cause but most aren’t – even the big fellas. In light winds with a big board and small sail, you don’t just learn the mechanics of various rig moves at an easy pace, you also become sensitive to how sail tuning effects the rig during the transitions. And big blokes especially should learn to sail with a small rig to stop relying on a load of grunt to hold them upright. Most of the skills so far have related to the classic old skool tricks. But what about the dynamic new stuff as performed by the elite? Is it a style the recreational sailor can aspire to? Here’s one more true tale to finish. Scottish Craig, 22, worked as an instructor for a centre in Vassiliki. I met him while I was doing a clinic there last June. One afternoon he came in looking particularly chipper because he’d just landed his first ‘flaka’ – a sort of aerial upwind 360 – very advanced stuff and amazing surely since he’d only been sailing for 2 years. And yet his story is not so uncommon amongst the ambitious youth of Vass – because all the right ingredients are in place. It’s freestyling HQ – knowledge, inspiration and training partners abound – as well as flat water. During the light wind mornings he would coach intermediates and so spend many hours doing ‘Old skool’ freestyle, gathering all the key rig handling skills that would serve him in his ultimate quest. 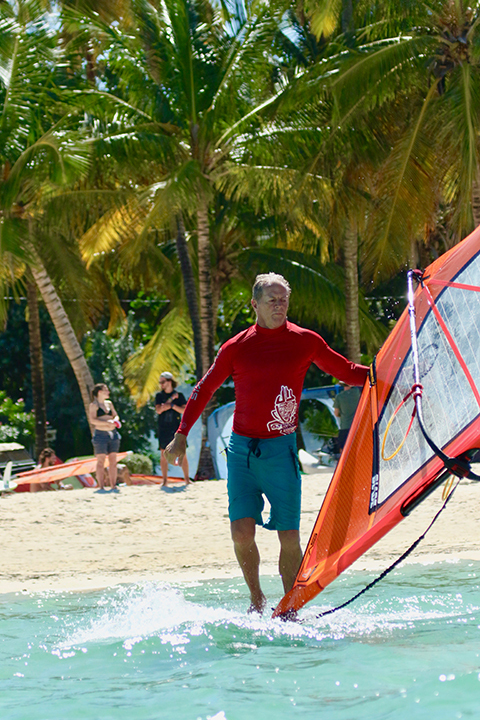 He only used the same 100 litre freestyle board and never a sail bigger than 5.3. That meant his whole sailing style was developed around the freestyle combo – notably the essential skill of getting planing by bearing right away to unload the fin and pumping from the straps. Sailing all day meant he was strong and sailing fit – another crucial ingredient in the new skool casserole. And one more thing – Craig was also a former rugby player and therefore used to getting kicked and trampled and then having to dust himself down and carry on. That’s new skool freestyle in a nutshell. The story has one last chapter. Two months later I returned to Vass on a family holiday and caught up with Craig. Once again he was chipper, this time having just completed his first … wait for it … carve gybe! He said it had been crazily difficult – far harder than the Vulcan. What?! You get good at the things you practice!